Custom tailor your care website with the features you need. Enable fundraiding, make your site private, approve posts before they are visible, or don't. It's all up to you. No ads. No fees. Privacy options. One personalized, safe & central place to journal & share your journey with your loved ones, or, the world if you choose. During life's most changing journeys, emotional support is imperative. But, so can financial support. We make it easy to get both. Support is a two way street. Our sites make it easy to cultivate a community of friends, family & strangers (maybe) in support. Organize & schedule meals, rides, etc. 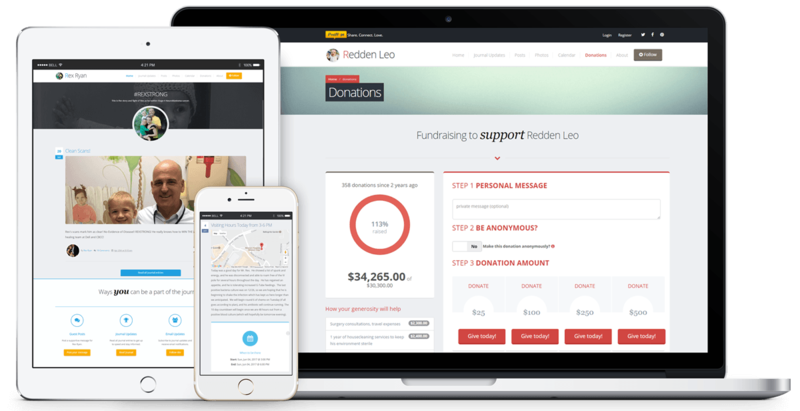 A seamless, intuitive and easy to manage website that makes it simple for you to keep in touch, raise funds and facilitate communication all in one place. This enables you to put the distractions aside and focus on what matters. Did we mention no ads?